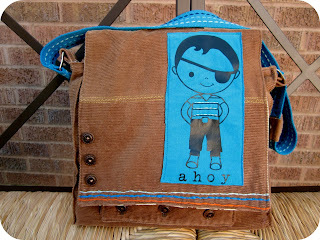 Here's a re-post of the boy bag tutorial in case you missed it! 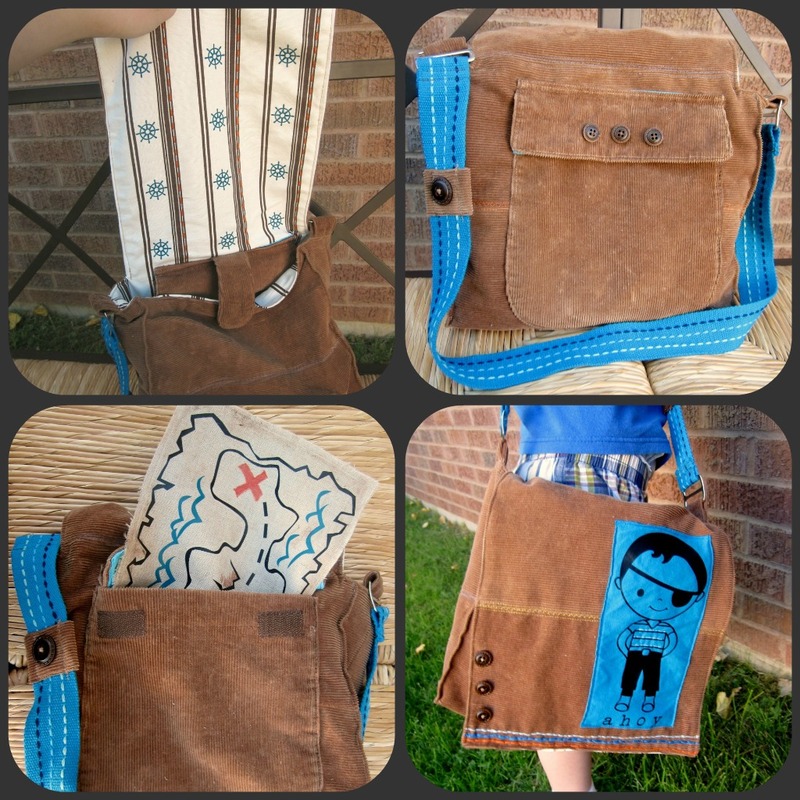 Confession: I didn't take a single picture when I was making the Boy Booty Bag. It took me until two days before the deadline to find a project idea I liked and I was rushing. So, we're going to do a couple of things. 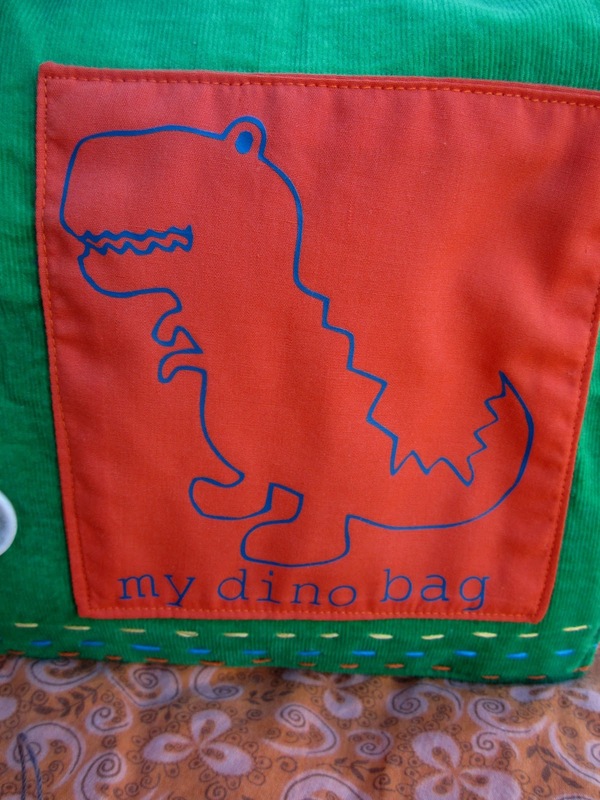 First, we're changing the name of the bag to something more general. Let's face it, if you don't happen to feature a pirate on the bag, a "booty bag" is maybe not the best name. 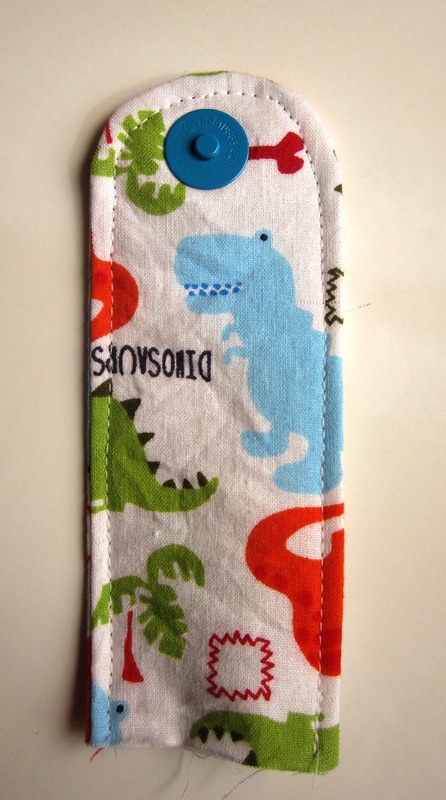 This time we're featuring dinosaurs. 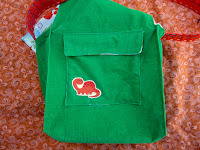 I'll be showing you how I made the bag using a whole piece of fabric. It's pretty much the same method as I used for the booty bag, only I had to cut up the suit coat and piece it together to get the size I am using in the pictures. 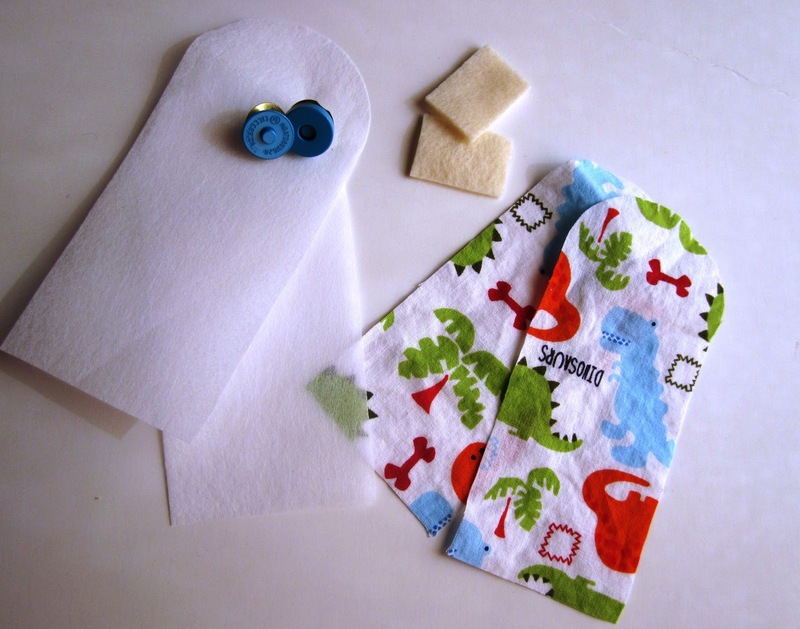 Don't feel like sewing your own? 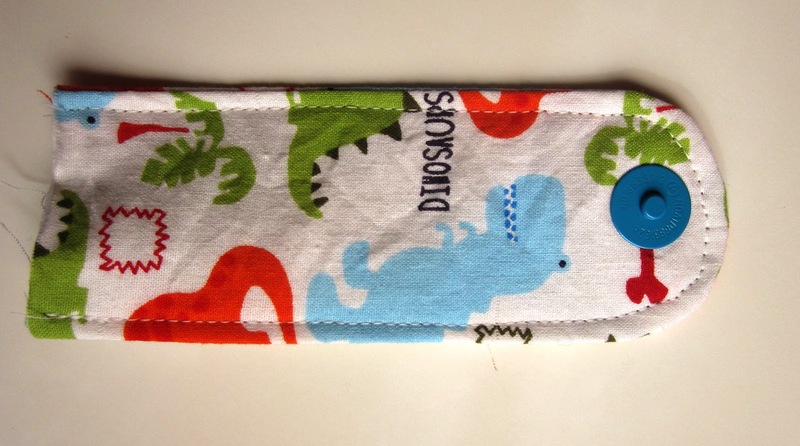 A couple of these dino bags are available in my etsy shop. Picture your bag as a box. Decide the height, width and depth you desire. Now you're going to take those measurements and turn it into a pattern. 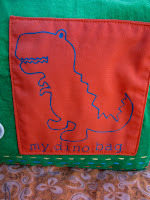 Here is the drawing I made for my bag. (This isn't to scale, so don't enlarge it and use it like a pattern). You will be taking your box measurements and adding them all together on your pattern. You'll need to add some extra length for seam allowance. I added 1/2" or 1" seam allowance- whatever worked up to an easy measurement to cut. One important thing to remember is to include your depth measurements for all four sides of your bag (they are shaded in the picture). 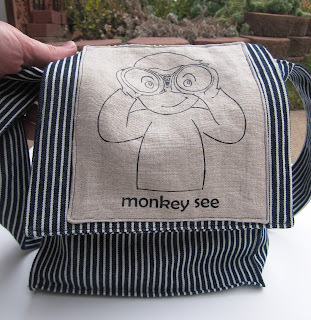 I made this Curious George bag to hold the ViewMaster my son received for his birthday a few weeks ago. 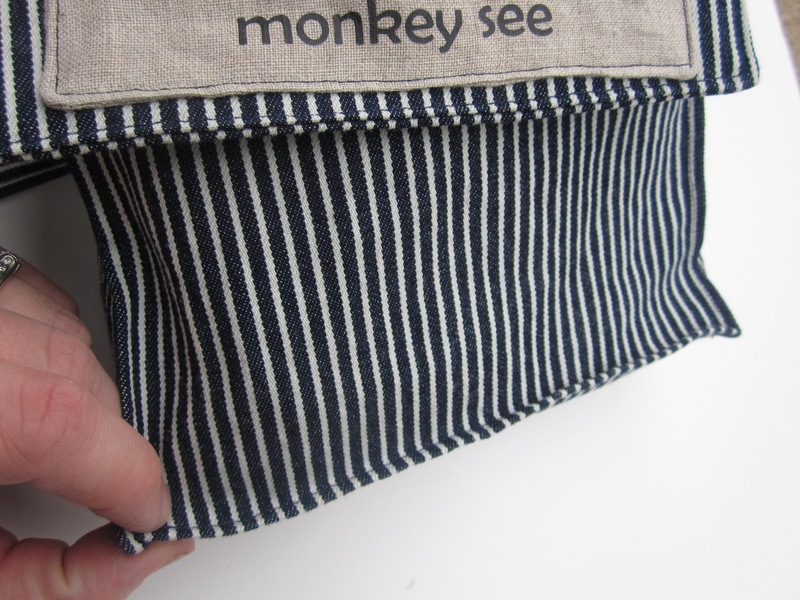 You can see that I forgot to account for depth in my flap measurement and George's picture folds funny because part of it becomes the top of the bag when the bag is full. And any pockets you plan to include. Plan for those too. extra fabric, straps, buttons, embroidery floss, etc, for decorating your fabric. The plan is the hard part. Once you have that, it will be smooth sailing...smooth-er sailing, at least. 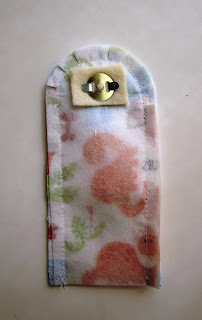 Cut a strip of fabric for the strap and any you plan to use for pockets. I added all my pockets and decorations before sewing the bag. You can add them later, if that's easier. 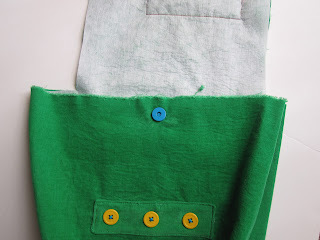 Take one of your large fabric pieces and fold the bottom up, right sides together Sew up the sides. 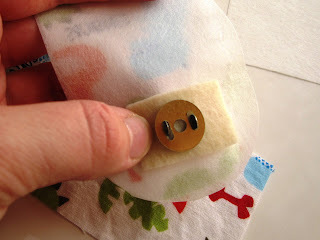 Do the same to the other piece of fabric. Pinch the bottom corners of each side together. Measure down as far as you need to go to give you the width you desire. 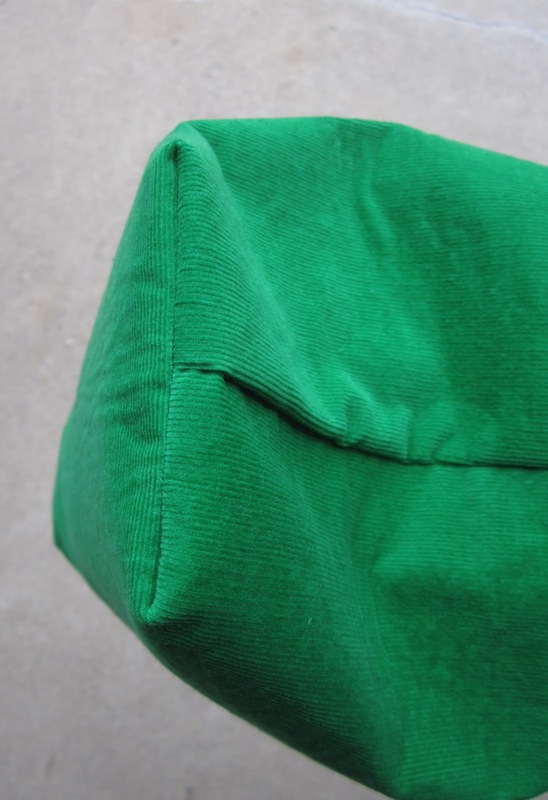 After sewing, you can cut off the excess corner piece. The outside will look like the picture on the right. 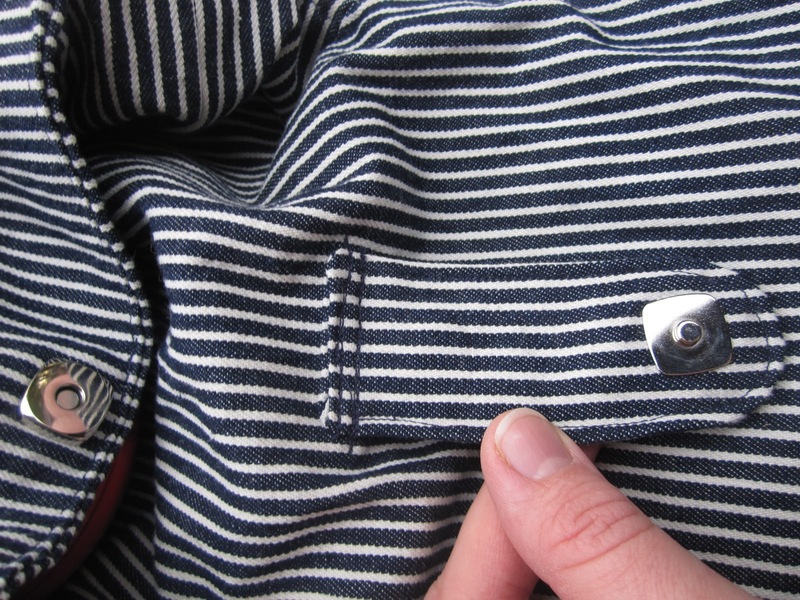 You will want to do the same thing to the lining. At this point, you want to work on your magnetic closure. 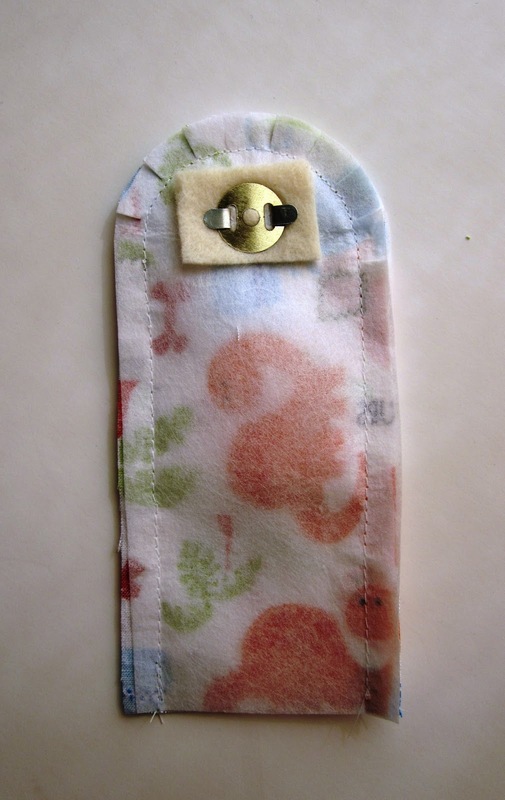 My fabric strap pieces, interfacing, magnetic clasp and a few small pieces of felt. Attach the magnetic closure according to the directions on the package. I also like to put an extra piece of felt in there to help reinforce the fabric strength. 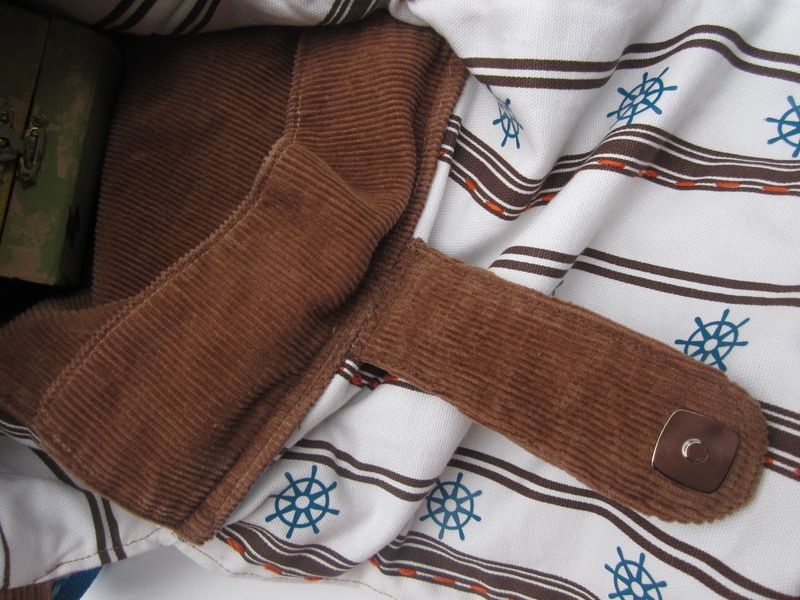 Sew around the strap. Clip the curves and flip inside out. 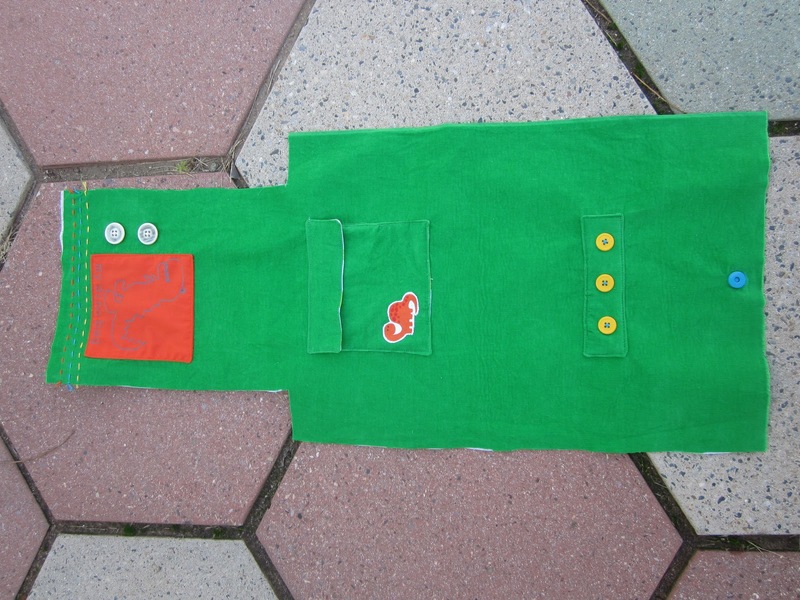 Toptstitch. 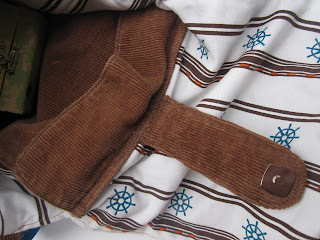 There are a few ways you can sew on your strap. 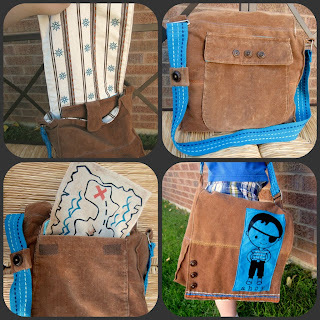 When I made the booty bag, I had a big pocket so I tucked the end of the strap under the pocket. With the other bags, I just folded the raw edge under and sewed it on. 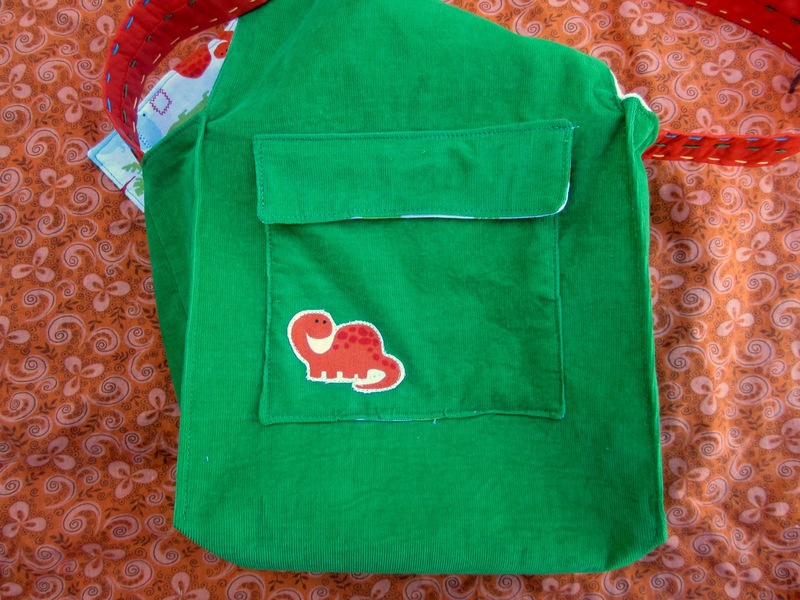 Place the other side of the magnetic clasp on the front of the bag. 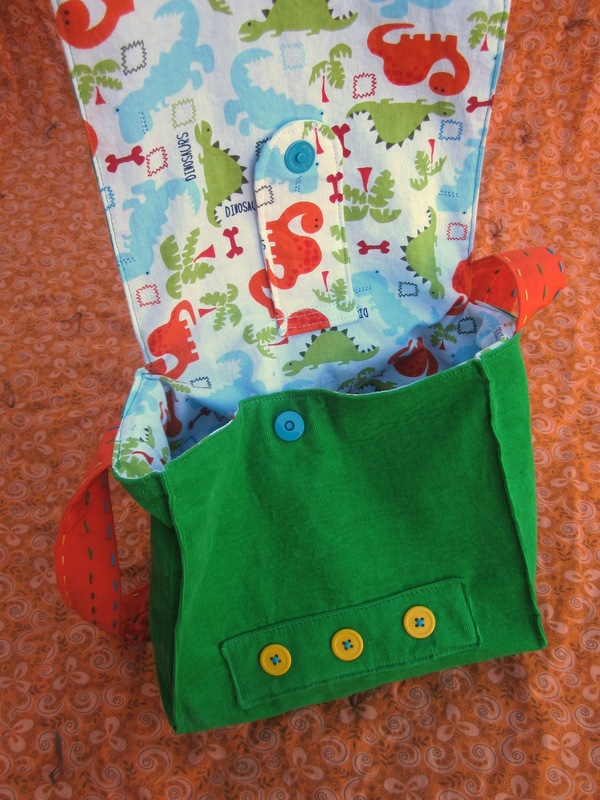 Keep it near the top, but leave room for sewing. Now you'll need your strap. 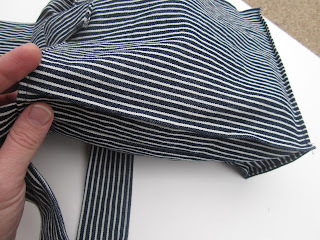 If you are sewing a strap, take your strap fabric, fold it right-sides-together, and sew up the long edge. 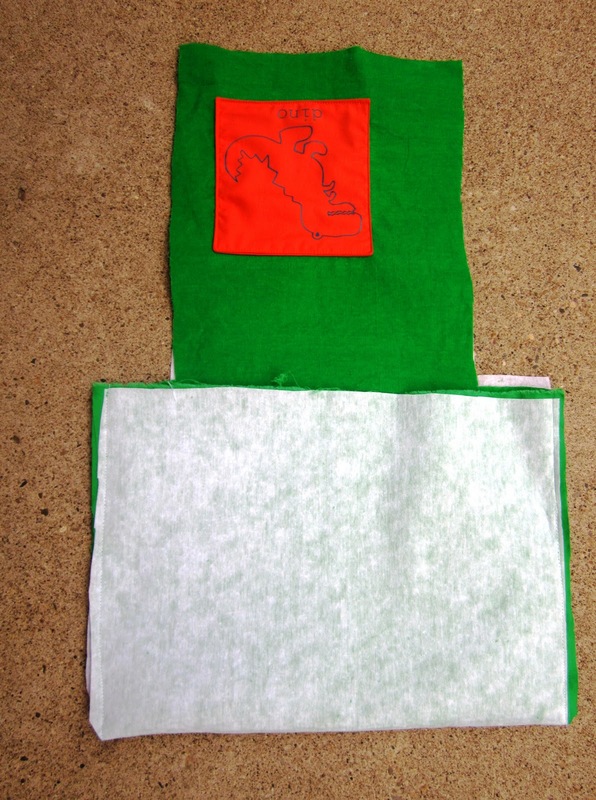 Flip it right side out, press and topstitch the sides. I added some embroidery floss to mine, for fun. 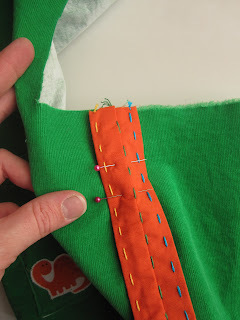 Once you have your strap, pin it right-sides together to the outer fabric of your bag, centering it with the side seams. Baste it into place. Tuck your outer fabric into your lining, right-sides together. 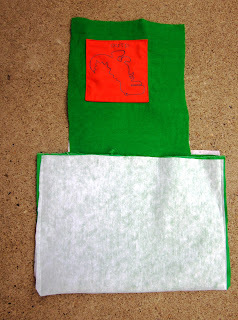 Pin the flap and top of bag together. 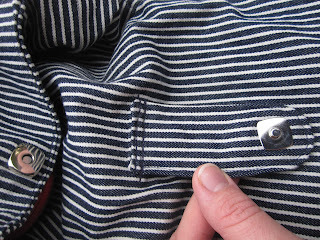 Sew all the way around, leaving a few inches open for turning. Be sure to clip those 90 degree angles where the flaps start before you turn it inside out. Turn the whole bag right side out and topstitch all around. Now, if you want to give the bag a "boxy" look, follow this next step. Pull the lining back out of the main part of the bag. This step will only be done to the outer piece of fabric. 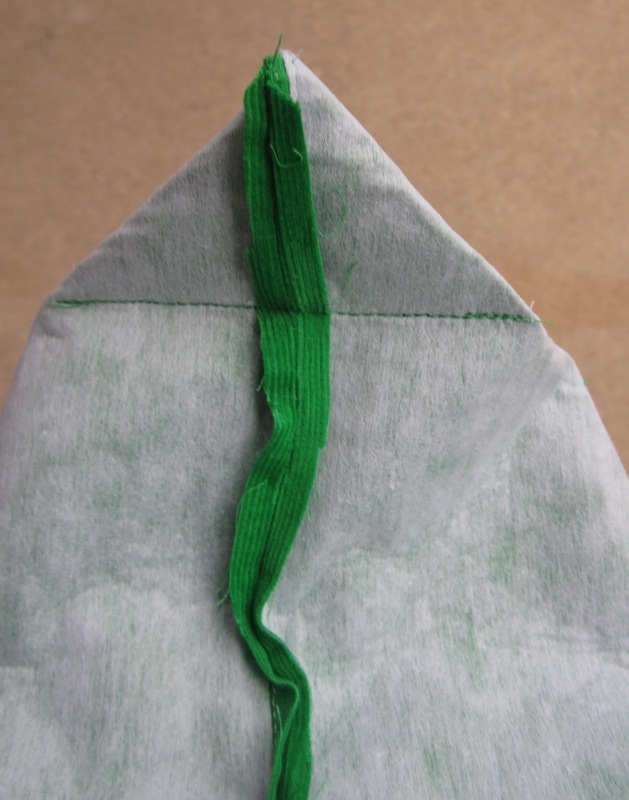 Pinch the fabric together to form a line between the corner of the bottom of the bag to the top corner. This will kind of be like making sides to your box. 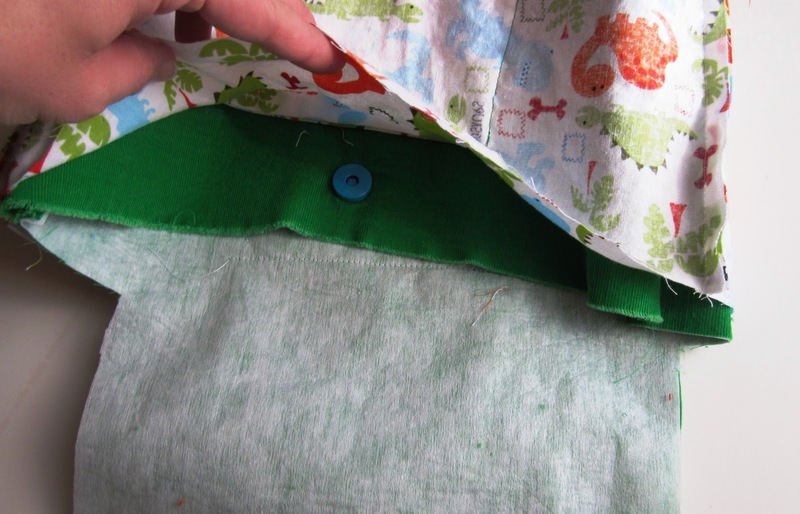 Sew up the side of your fold about 1/4" from the edge. Do this 4 times, once for each side. 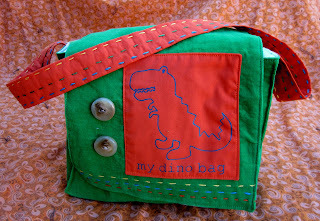 I had some embellishments in the way for the dino and booty bags, so I didn't make the boxy seams on the bottom of the bag, but I did for the monkey bag. I really like the extra boxy look. Boom. You're Done! And you're ready to send your little guy off on an adventure. This is awesome- you did a great job! New Follower over from the Silhouette fickr site! Thank you for the how-to for measurements. 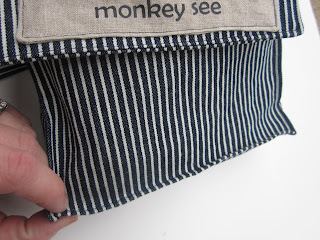 I wanted very specific dimensions for our library bag and now I have them! 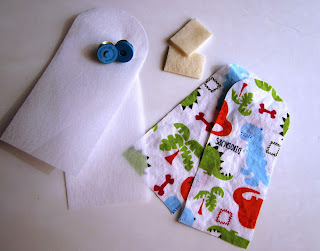 Can't wait to get into some fabric! Thank you for posting this how-to. It was exactly what I needed for the basic instructions AND to let me finagle it how I needed it. Thank you!